Wow, I haven't written a Sunday Stash post in a while! I haven't been buying much fabric - after all, I've filled in many color gaps in my stash over the last two years, and I only tend to buy when I need something. However, when you see it, sometimes you just have to go for it. Plus, I was going to be in the vicinity of two great shops, and I wanted to support them. By the way, this post is not sponsored in any way - just expressing my love for fabric and wonderful shops! 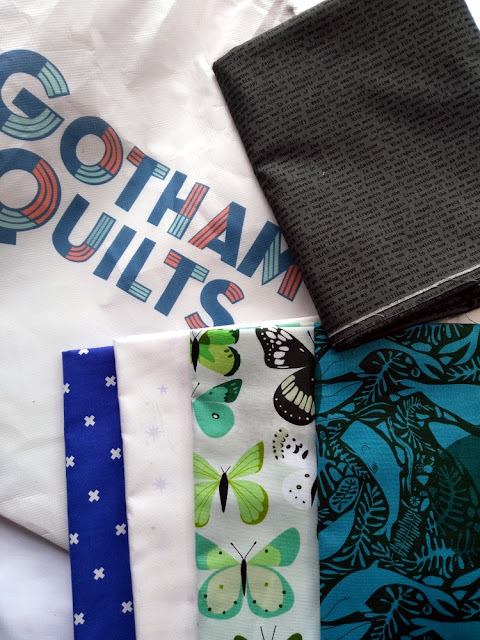 This week, I visited Gotham Quilts in New York City for the first time. I was only around for the day (my sister and I had some fun plans) and Ivete, one of the owners, was so kind and helpful. I had met Ivete and Andrea at NJ QuiltFest earlier this year, and ever since then, I hoped I'd be able to visit. We're at least 1.5 hours from NYC so I don't get to go to the city as much as I'd love to! I found some gems, including some recent Lizzy House prints I had trouble getting my hands on, the green butterflies (I used up almost all I had with Peace), that Cotton and Steel "X" print in a brilliant shade I'm obsessed with, and the dark gray Alison Glass text print. I was thrilled to find that one because I needed that EXACT shade for a quilt I'm starting (and I really wanted to use a tone-on-tone print instead of a solid). Plus, I got this nifty drawstring bag with my purchase. If you're ever in the city, I highly recommend a visit, especially if you LOVE modern fabrics. Thanks, Gotham Quilts! 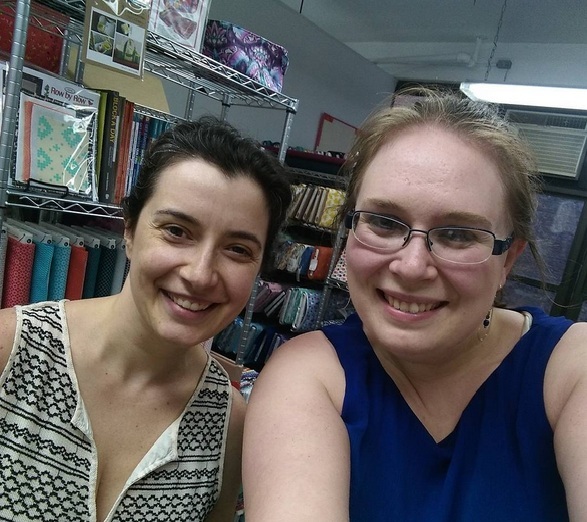 Side note: That day, I got to visit with another quilty friend, Chris of Made By ChrissieD! We had a nice chat with coffee in the sweltering heat of Bryant Park. 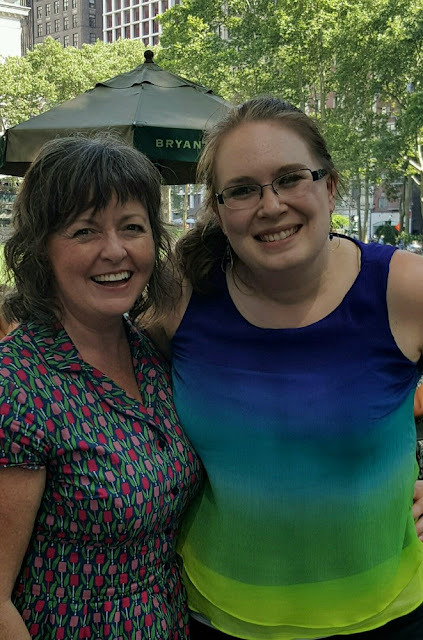 I love that almost wherever I go, I can find someone quilty to meet up with - bonus if they are already a friend. :) It was fab catching up with you, Chris! 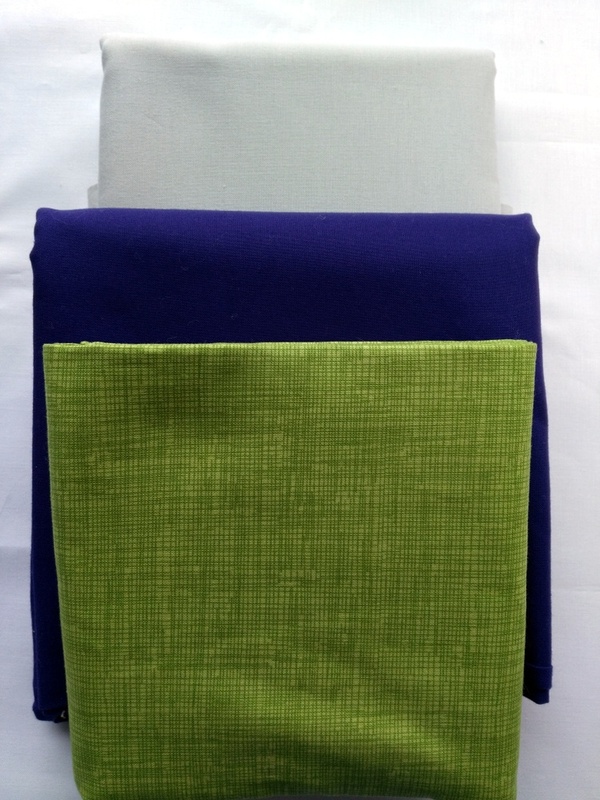 My second set of fabric purchases came from Rock Paper Scissors in Montclair, NJ, where I occasionally teach. I always ooh and ahhh in Beth's cozy, bright store. I bought some much needed light gray (I pretty much buy it wherever I go because I tend to use it for binding - sorry, I don't know which one this is and I don't have a particular favorite right now). I also pounced on that LOVELY Kona Regal fabric, an amazing blue/purple that can only be accurately seen in person. I'm considering using it for Yvonne of Quilting Jet Girl's Snowflake Shimmer QAL (I'll be picking final fabrics soon!). Finally, I chose the lime green sketch print (from Timeless Treasures?) because I've been using so much of it lately. Even my husband remarked he had seen a lot of it. Gotta keep the good stuff stocked, amiright? If you're looking for more stacks of pretty fabric, make sure you check back on the blog this week - members of the Star Light, Star Dark QAL can link up their fabric picks tomorrow! I'm pretty sure I want some of everything you picked up! So lovely! Great stash additions, Sketch is one of my favourite basics and my small children can now identify it too! I agree with Yvonne, your blouse is gorgeous! When you buy fabric for your stash, how much do you usually purchase?